Simple, delicious, and quick what more could you ask for? Spray a muffin tin with nonstick cooking spray. 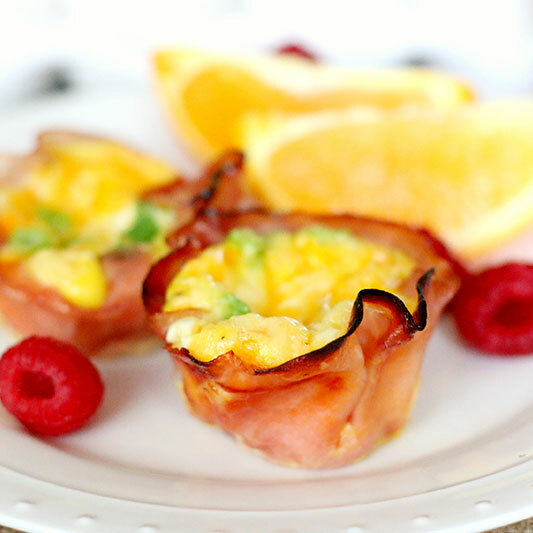 Place individual ham slices over each muffin cup and gently press down in the middle until a cup shape forms. In the bottom of each ham cup, add in about a tablespoon of shredded cheddar cheese. In a medium bowl, whisk eggs together. Stir in sliced green onions and salt and pepper, to taste. Add a couple of tablespoons of the egg mixture into each of the ham cups. Place muffin tin in the oven and bake for about 20-25 minutes. When done, use a fork to gently remove each ham cup and serve..